A growing number of studies are suggesting that a significant proportion of Americans are deficient in vitamin D. While it’s known that low levels of vitamin D can hurt bone health, new research reveals that this deficiency may also increase the risk of dementia. Given that dementia significantly decreases both quality of life and your ability to live independently, both doctors and scientists are focusing on developing new strategies to prevent this class of neurological diseases. A new study, published in the journal Neurology, suggests that maintaining adequate levels of vitamin D may be one such strategy. For decades, doctors have been telling people that vitamin D is important to bone strength because it helps the bones absorb calcium. However, additional research has suggested that vitamin D may also be pivotal to a robust immune system, proper nerve and muscle function, and optimal cell growth. The authors of the new study wanted to find out whether vitamin D levels also had an impact on the risk of developing dementia. 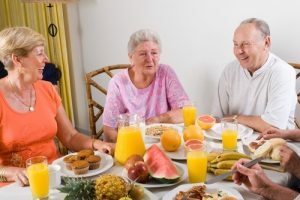 For their investigation, the researchers reviewed information collected from 1,658 elderly individuals who participated in the national Cardiovascular Health Study. At the start of this study, no participating adults had histories of dementia, stroke or cardiovascular disease. Each individual was followed for an average of 5.6 years, providing blood samples for analysis of vitamin D levels. Five years into the study, 171 participants had developed dementia, including 102 people who were diagnosed with Alzheimer’s disease. Based on blood test results, the authors concluded that those who were deficient in vitamin D were more at risk for dementia compared to those who had sufficient levels of the nutrient. Where do you get ‘the sunshine vitamin’? The silver lining to a vitamin D deficiency is that it is easy to treat. The nutrient is known as “the sunshine vitamin” because your skin will actually produce it as a reaction to sun exposure. Experts estimate that between five and 30 minutes of unprotected sun exposure twice a week between the hours of 10 a.m. and 3 p.m. is enough. Mushrooms grown in ultraviolet light. You’ll know if your mushrooms have vitamin D by reading the nutrition label. Ultimately, maintaining adequate levels of vitamin D may be one more lifestyle adjustment that will help you stay mentally sharp for as long as possible. Your health advisor can help assess other risks for dementia along with appropriate steps to help you to maintain good cognitive and physical health. To learn more about dementia and related neurological problems, click here.